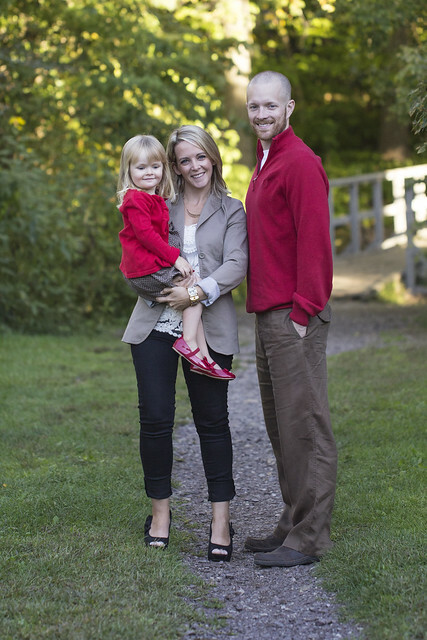 By now, most of our family and friends should have received our Christmas cards, so I figured it was as good a time as any to share this year's family photos and send a little Christmas cheer to those of you who are still reading along with my mostly silent blog! 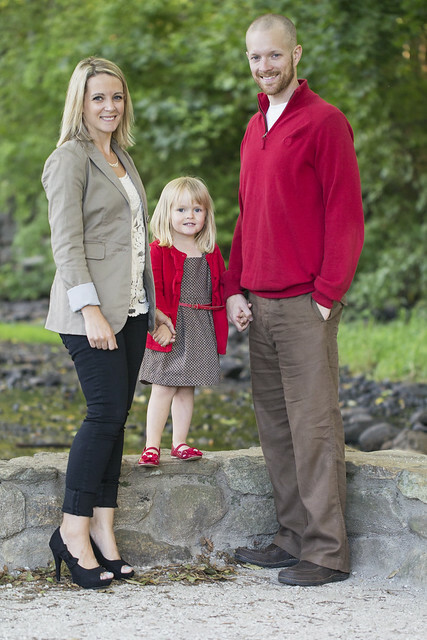 We had our photos taken by B's cousin back in September when we were visiting family in Massachusetts. You can find her website here. She had the perfect location suggestion and nothing makes it easier to get in front of the camera than knowing your photographer! 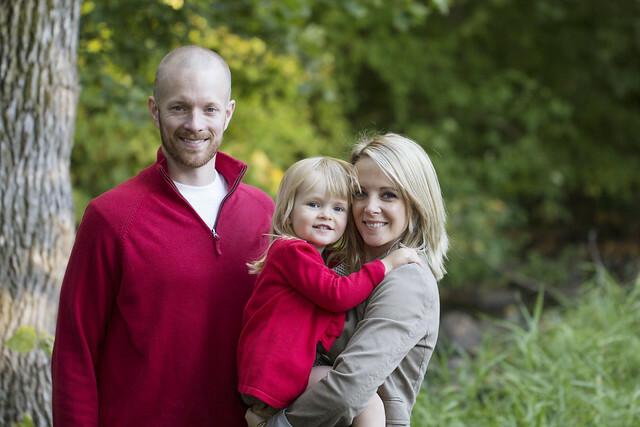 If I have any readers in the Boston area, I highly recommend Amy! Seriously, just look at these smiling happy photos! What makes these photos even more special to me, is more than likely these will be our final photos as a family of three! 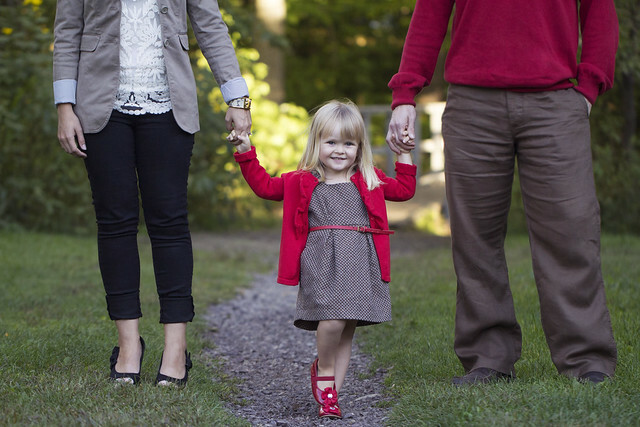 We are expecting a little bundle come May and we are all so thrilled that our family is FINALLY growing. It took us longer to get here than we hoped, but it all seems to work out perfectly and Halle is anxious to be a big sister! She asks almost daily, "is the baby coming home today Mama?". 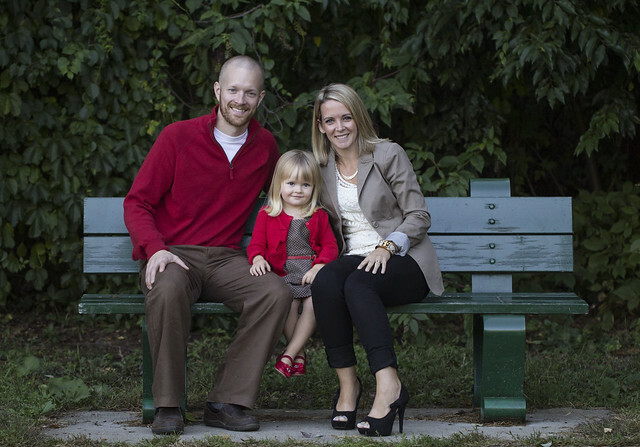 So that's our big news, and a look at our family for 2014. I can't believe Halle is getting so big... and that soon there will be another tiny one around here. Life is crazy and full, and I am so incredibly happy - for real. 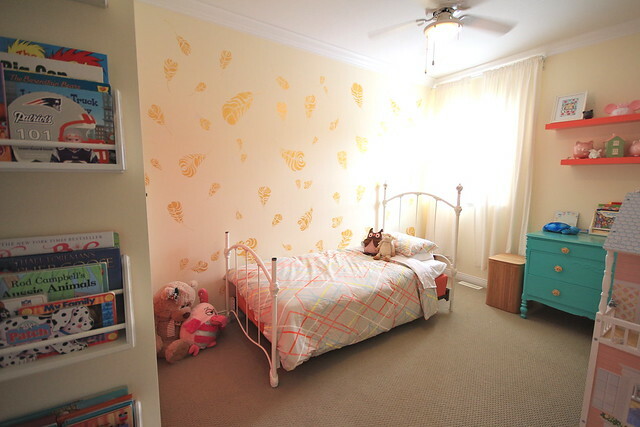 Of course, new baby also means relocating our upstairs guest bedroom downstairs - which means a whole new room makeover down there, as well as some nursery decorating in the future! I can't wait to get on top of all of it... and maybe I'll even blog about it along the way? Well hello blog land. It has been a while, and I've honestly been a little torn on whether I miss blogging on not. I miss the community, but I feel like I'm still connected to a lot of those people on other social media networks. I don't miss the pressure I used to feel to constantly be putting together quality, inspirational content. It's not always easy to come up with something that is worth blogging about these days. I am sure a lot of you can relate to that! Honestly, today I was supposed to be taking part in a really awesome Canadian Bloggers Christmas Home Tour, but we just weren't in a place to share anything really fabulous and inspirational from around here, and now I feel like I've let down a bunch of really awesome bloggers. For that I feel awful. Today though, I FINALLY have something worth sharing and there is more coming soon! We're finally crossing some big projects off of our list, which is great because we are adding some more big projects to our list for the new year. 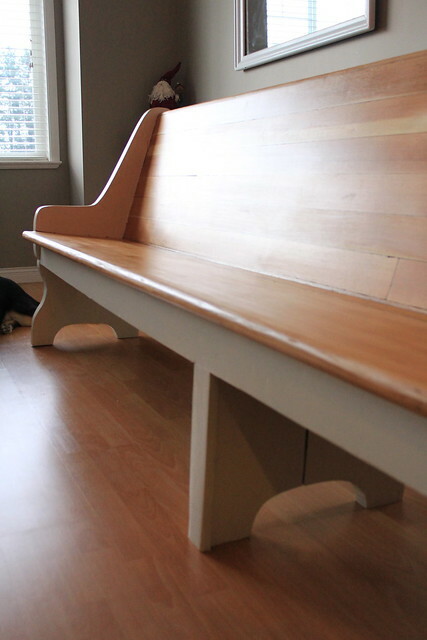 For now, I'm excited to share our completed church pew in our dining room! It was SO MUCH work, but we both agree now that it was totally worth it. 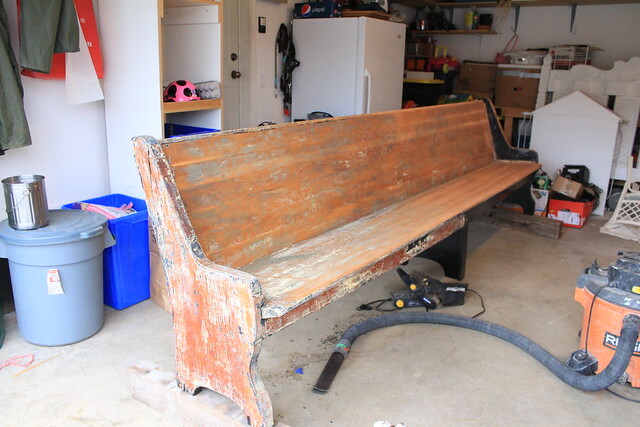 All of that stripping and sanding revealed some gorgeous cedar on the seat back. 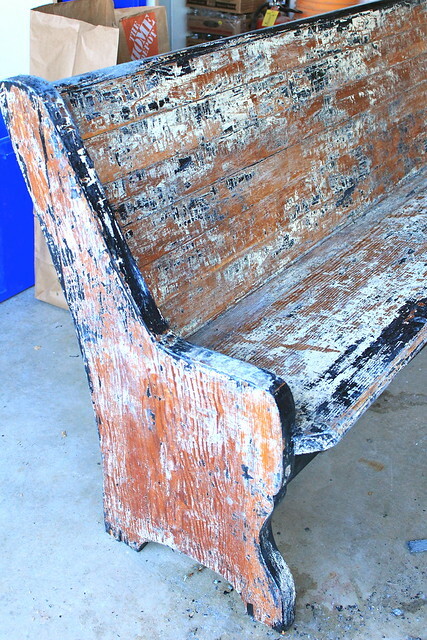 The wood of the seat wasn't quite as nice, but still had a neat grain to it that we really liked. 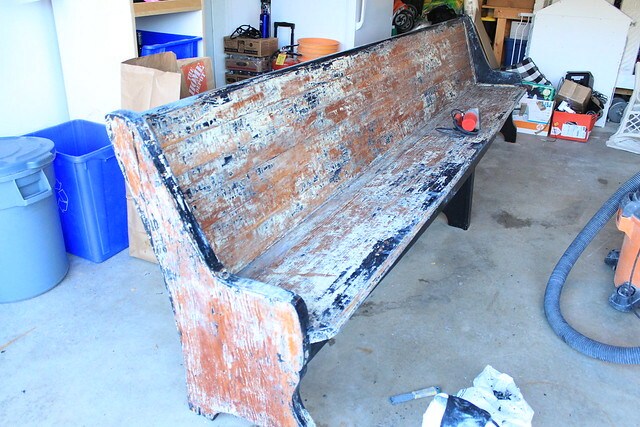 After some discussion we decided to clear coat the back and seat. 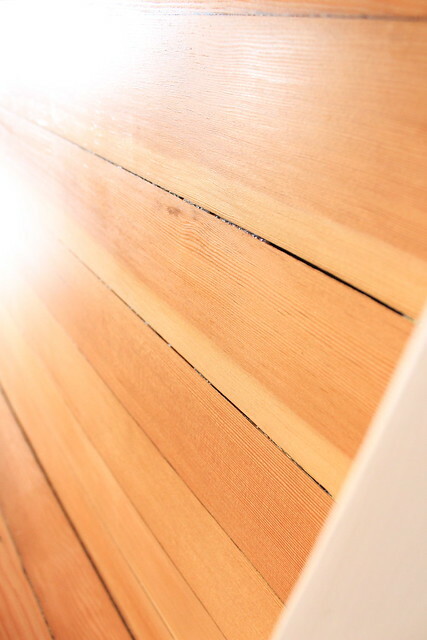 There is still some paint stuck between the boards, and a lot of variation in the colour of the cedar since some spots needed more sanding than others, but it looks so great. 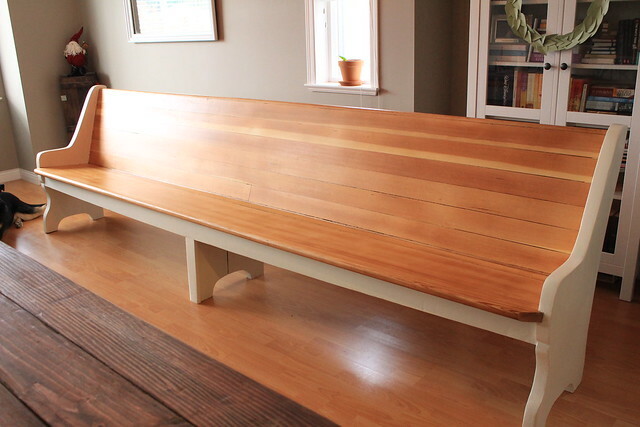 Since these wood tones differ from our dining table, we decided to break up the colour a bit and paint the arms and legs of the pew. I picked out a variety of warm white paint chips from the Home Depot and we started by comparing the chips to our head chairs in the dining room. 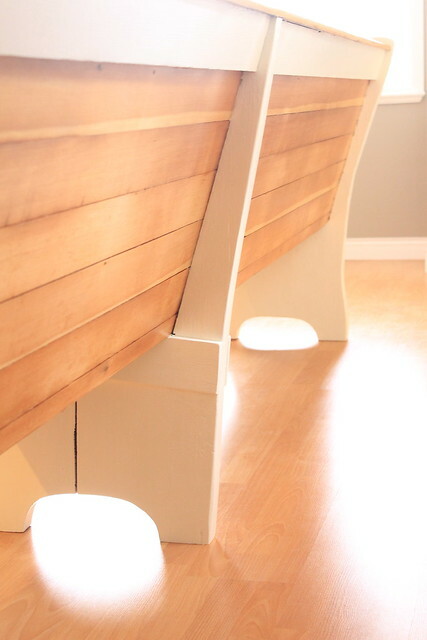 We were able to narrow it down to 4 colours, and once we had all of the cedar stained on the bench we compared our colours again. 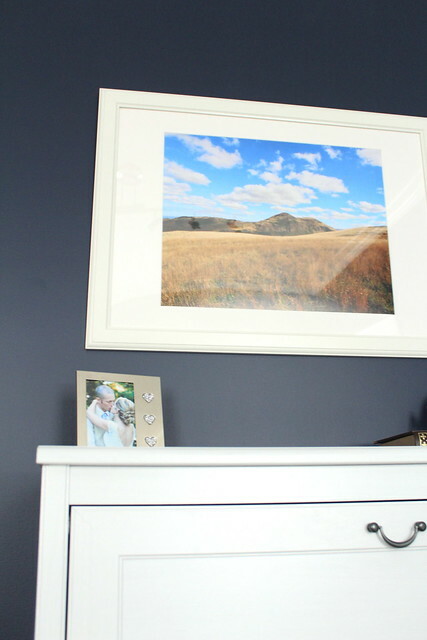 Our final choice was called "Clean Canvas" from the Home Decorators collection and it is perfect! B finished it last week and a friend came by on Friday to help him move it into the house (and up the stairs... a little awkward, but they were troopers). 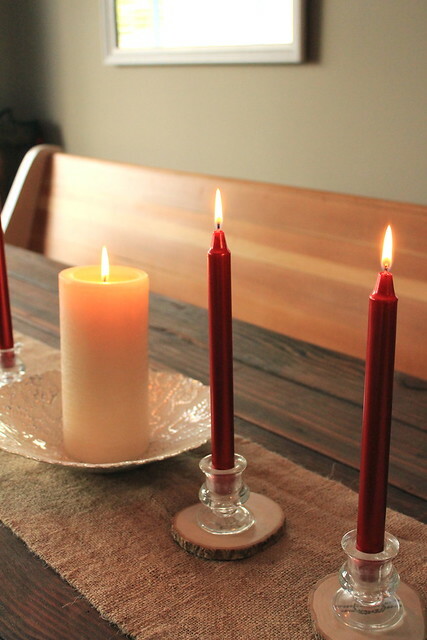 We'll be using it this Thursday to host our annual Thanksgiving dinner, just as we had hoped! 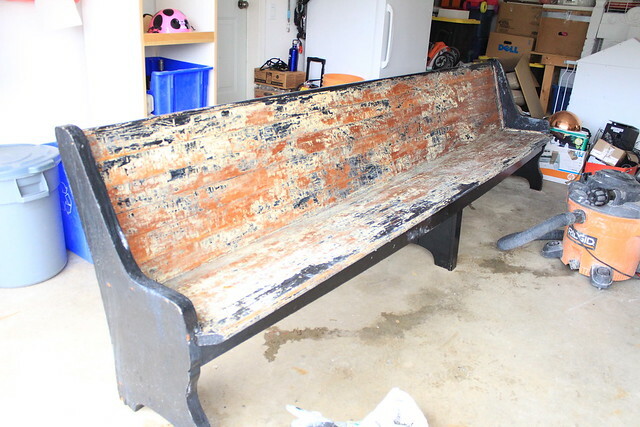 I honestly cannot believe this is the same piece of furniture that we brought home. 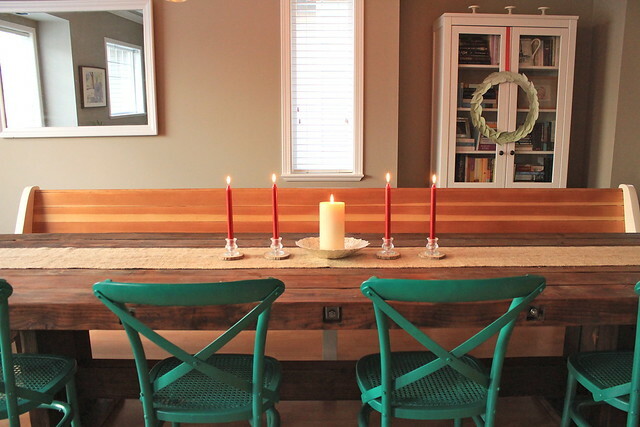 It adds so much to our space, though we are far from finished in the dining room. At least for now we are ready to host our friends on Thursday! At Halle's request we ate our pancakes at the table on Saturday morning, and all agreed that this room is exactly how we imagined it! 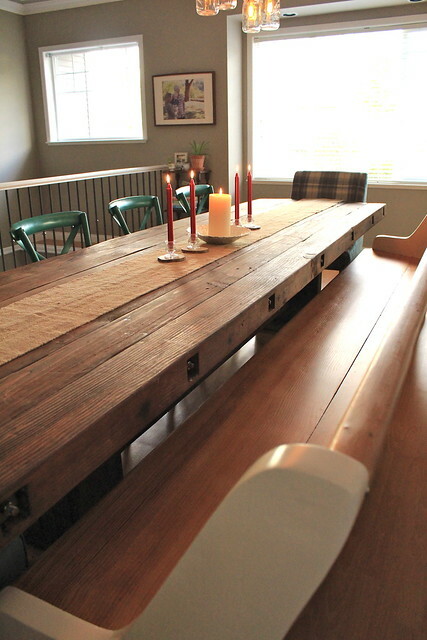 Such a great space for a large table for gathering family and friends... or just enjoying a yummy Saturday breakfast together! Welcome September! My favourite month of the entire year - one that brings the feeling of a new start, the beginning of fall (my favourite season as of late) and of course my birthday. And this September 1st, I have one more reason to love this month. 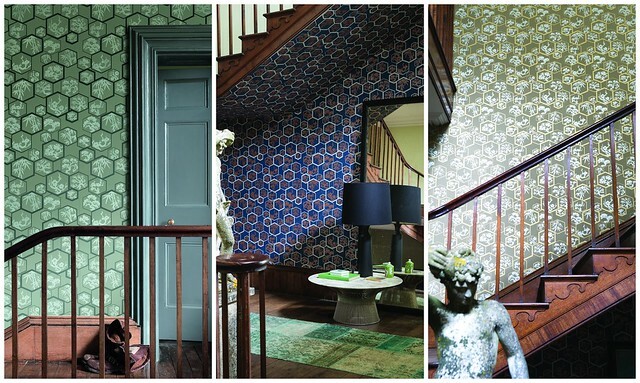 Today Farrow & Ball is launching 4 new stunning wallpapers, inspired by Japanese craftsmanship. Using their own paints and unique production methods, Farrow & Ball have created the perfect papers to bring pattern, colour and texture into your home. When the samples arrived on my doorstep late last week, I was instantly won over by the quality of the paper and the texture of the designs. Though they offer big bold patterns and colours, I found myself more drawn to the subtle tones and finer designs. Yukotori (meaning birds flying away in a group) is, without a doubt, the design that I am most drawn to. 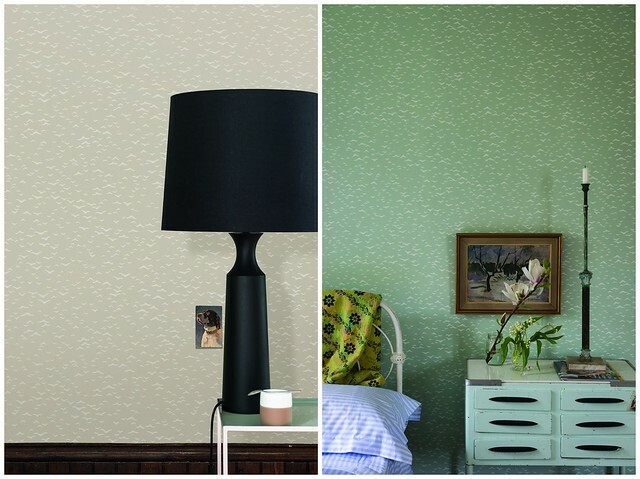 The pattern is simple and delicate, and could bring a sense of calm into any room, no matter which colourway you choose. 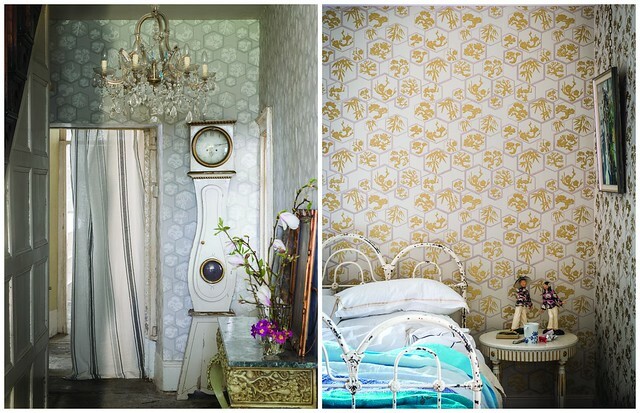 My guest room walls are screaming to be covered in this gorgeousness! 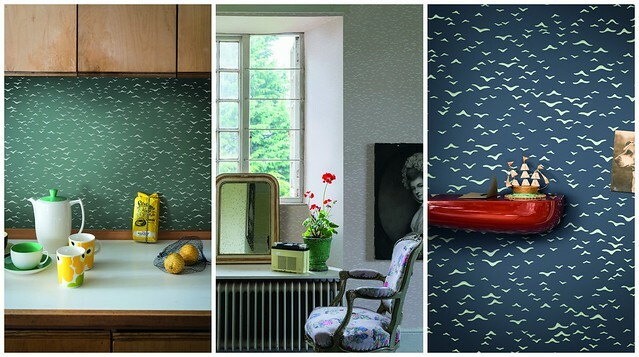 If the birds aren't really your thing, Amime is the other subtle pattern offered in this collection. This design is taken from a Japanese pen and ink drawing and the name means the space between netting. Moving towards the bolder patterns, Aranami will bring the rolling waves into any room you choose. What I adore the most about this paper is how the waves rise up to meet one another brings so much depth to the paper. 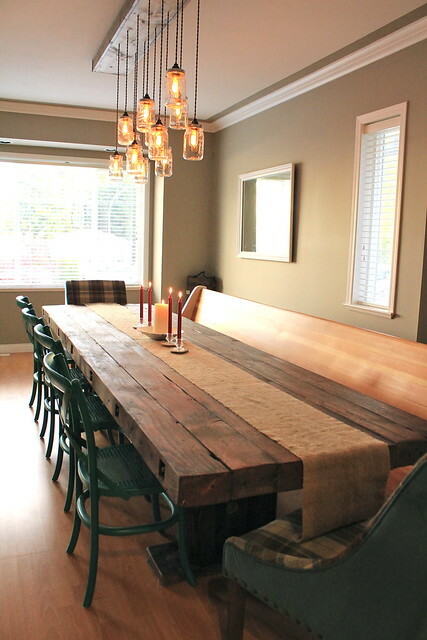 I'd love to see this in a dining room (mine to be exact) over a chair rail with a solid colour below. Last, but certainly not least, Shouchikubai is what I believe to be the showstopper (specifically in the metallic gold colour). The paper features flowers, bamboo and trees in hexagonal frames, all of which bring a very obvious Japanese feel to this design, which is taken from a metallic print found in Kyoto. As much as I found these wallpapers gorgeous when I saw the first photos from Farrow & Ball, nothing can compare to seeing and touching these works of art. The quality and craftsmanship that Farrow & Ball is known for, is present in each of them and I'm certainly itching to wallpaper all over this place! Which one is your favourite, and where would you love to use it in your home? Don't forget, they are all available for purchase as of today. Visit their website here to find your nearest stockist! While this post is brought to you by Farrow & Ball all opinions are my own! I would never, ever share something that I didn't absolutely love with my readers! I don't know how I got so lucky - to find this wonderful man who loves me unconditionally, supports me, laughs with me.... and let's me know when I'm being a little crazy or over the top. 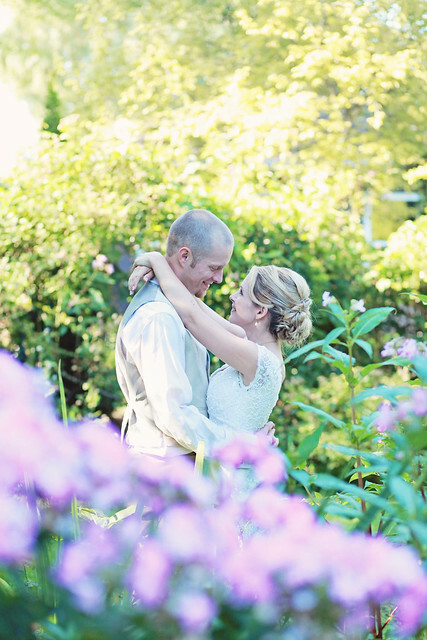 He is the best husband I could ever ask for, and also my best friend. He's also the best father to our sweet girl. 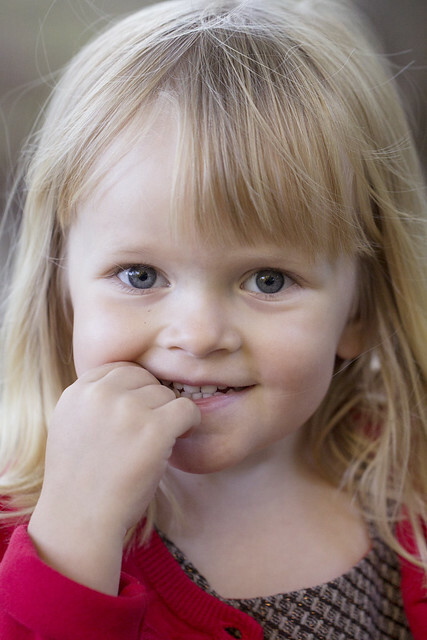 I love hearing her shout for Daddy every day that he comes home from work. Happy Anniversary B! I love you with all of my heart. 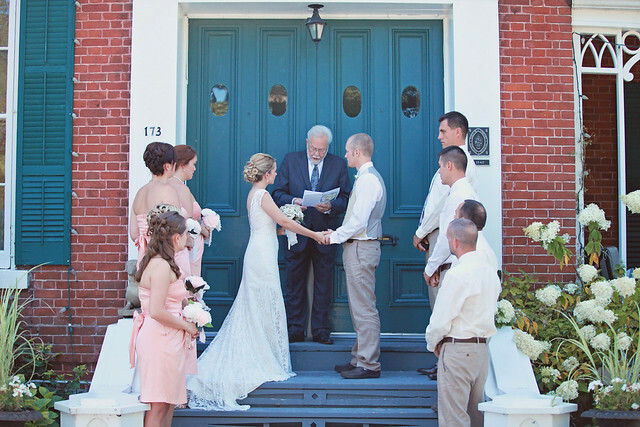 Here's to many more happy years together! Last month I got an email from Shannon at AKA Design, asking if I would like to take part in a Canadian Blogger Home Tour. I jumped on the opportunity... and a few days later reality set in and I freaked out a little. I kept thinking "Our house is a mess and not really anything special"... then I told myself to breathe and thought about this realistically. We've lived here just over a year (15 months to be exact)... and I'd say that in that time, we actually have done a reasonable amount of work to make this home reflect who we are. When we bought this home, I was so excited to finally have a space to turn into my own office/craft space. 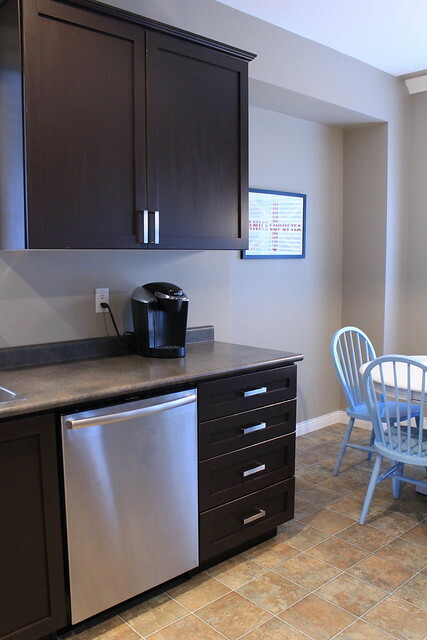 In our previous home the area was shared with our laundry room and it could get very crowded very quickly. The first thing we did in here was to paint the walls. 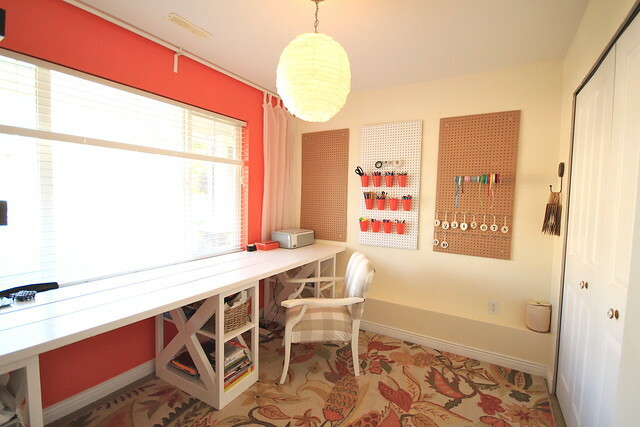 I used the same two colours that were used in Halle's room (Pearl and Coral). 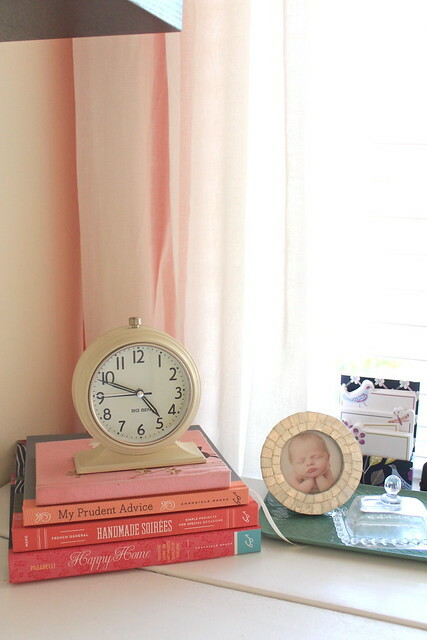 The little bit of coral on the window wall was the perfect punch of colour but it's not too overwhelming in the small room since it's used sparingly, and the sheer curtains help to soften it a bit as well. I also replaced the light fixture with a paper lantern that I DIY'd , and we hung some pegboard on the wall to help with organization. 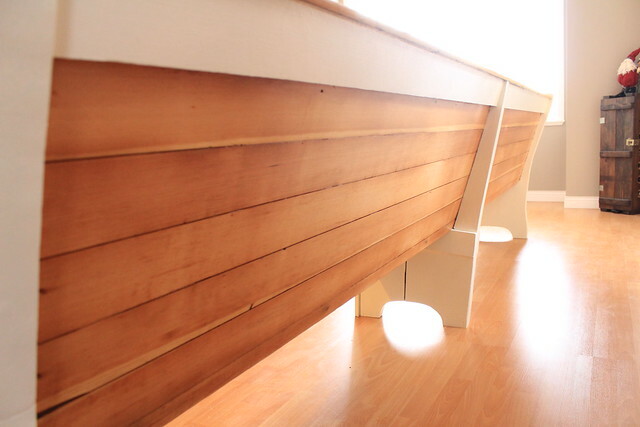 My favourite part of the room though, is the huge desk B built for me that runs wall to wall. It's the perfect spot to spread out and craft, sew - whatever creative thing I desire. For my pegboard storage we bought some hooks for hanging my tags that I paint. I also used a small dowel on hooks to keep all of my ribbon organized. For my pens, pencils, etc I used plastic cups and punched two holes around the top edge. 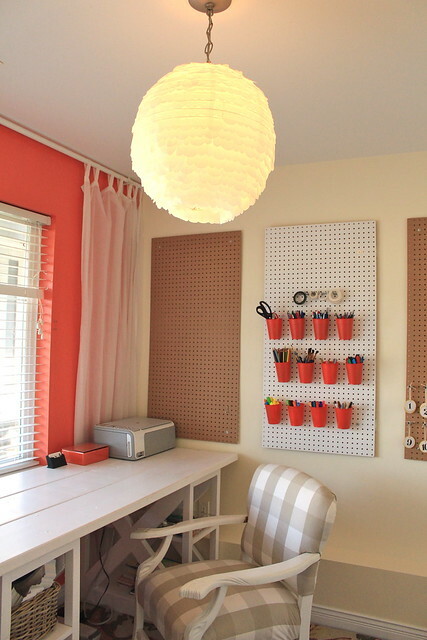 I then used zip ties to attach them to the pegboard. A perfect spot to keep everything easily accessible from my desk, and neatly organized. I also think it looks kind of pretty with the coral cups (that were left over from H's 2nd birthday party) offset in rows. 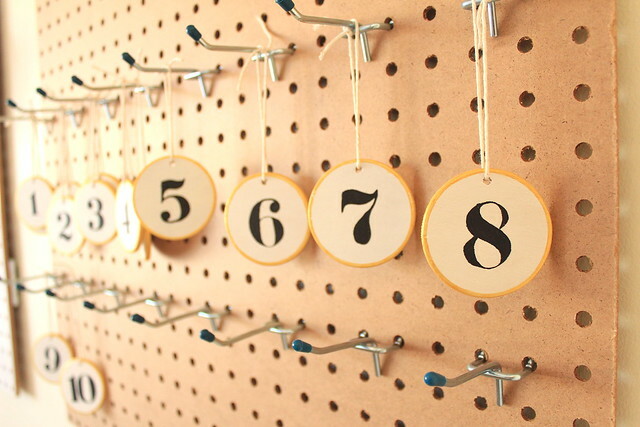 Who doesn't enjoy some pretty organizational solutions? 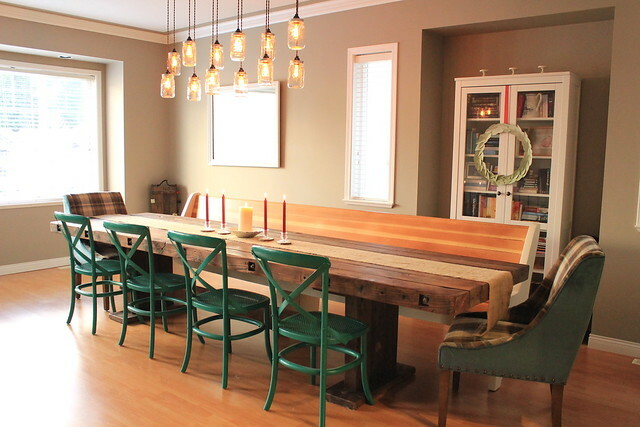 The dining room was originally meant to be two separate areas, with a seating area by the window and a smaller dining table located under that light fixture. 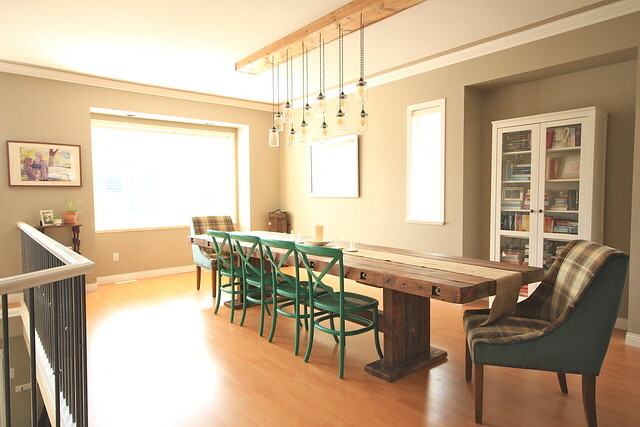 When we bought the house we envisioned this area as one large dining room that could seat all of our friends, so that is what we did. 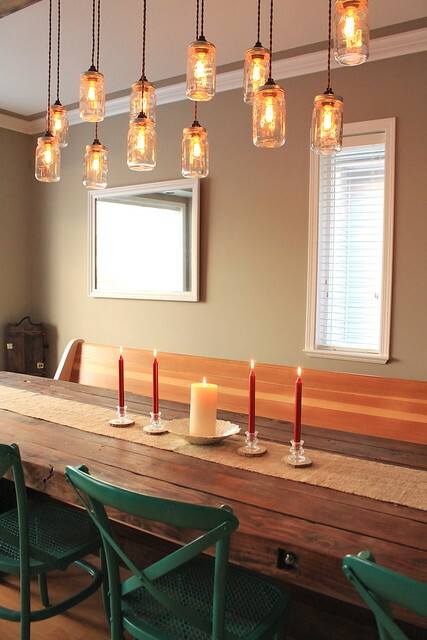 B built the table for around $100 (it's 12 feet long) and he also constructed the light fixture using pine boards. 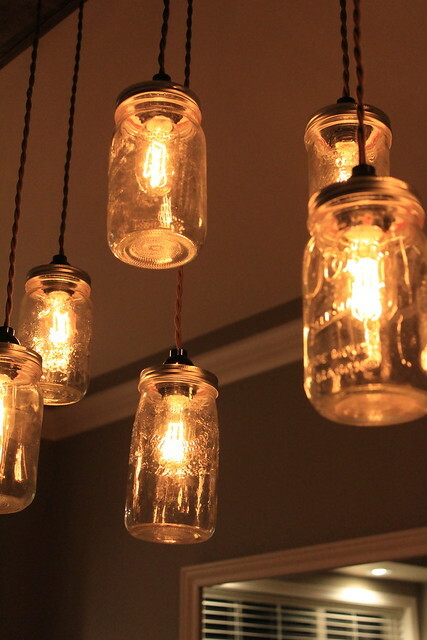 We ordered the wire from a company online and bought the mason jars from someone local. 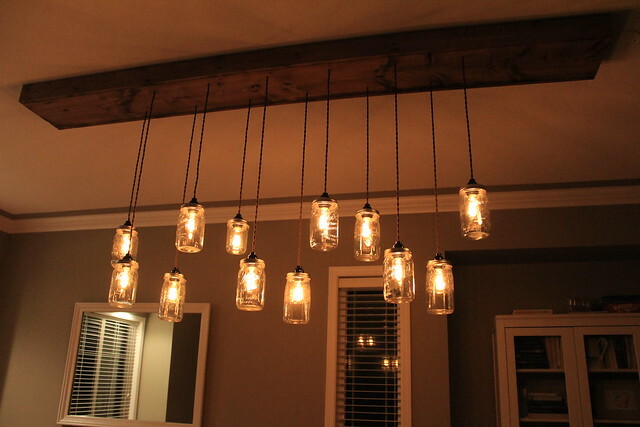 We bought the filament bulbs (plus some extra's) from Restoration Hardware during their lighting sale early in the year. To keep the jars from getting too hot we just drilled a few small holes into the snap lips. I found the small table at Salvation Army for $3, and it's perfect in here since the wood tone works with our dining table. Our large family photo I had printed when Shutterfly ran a "free" 16x20 deal and the frame is a simple IKEA Ribba frame. Artwork is one thing we need to add more of to our home - it's slow going, but we're getting there. On the table is a burlap runner that my Mom sewed for us, using burlap left over from our wedding tablecloths (she sewed those for us as well). 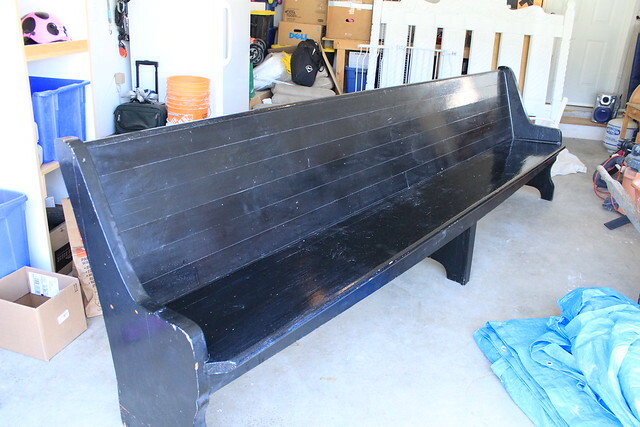 We have so many more plans for this big room (like the 11 foot church pew we are working on for the opposite side of the table), a built in where the too small bookcase currently lives and maybe even a window seat. I'd also like to paint in here, but that is a much larger commitment as our house is pretty open concept. Since moving in, in May of 2013 we've done quite a few things in this room. We started by replacing the light over the kitchen sink, with a fantastic $7 find at Home Depot. 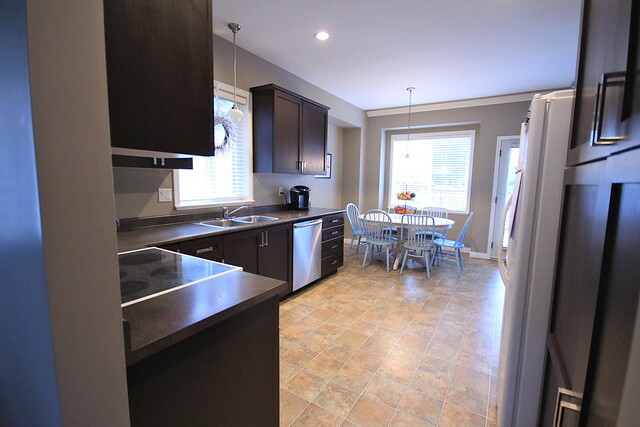 Then around Christmas last year we made some bigger changes, including a new dishwasher (after the old one started to leak and flood the kitchen) and a complete makeover of our kitchen cabinets. 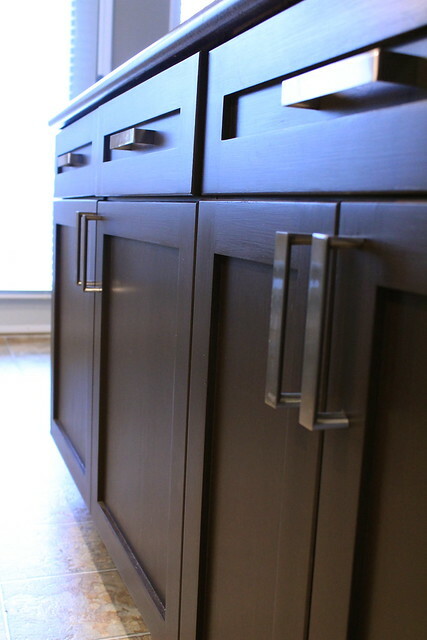 Not only did we change the colour using Cabinet Transformations from Home Depot, but we also upgraded the hardware to something more substantial. It's not a forever solution, as down the road I think we'd love a full kitchen renovation, but this has made us very happy with the space for the moment. 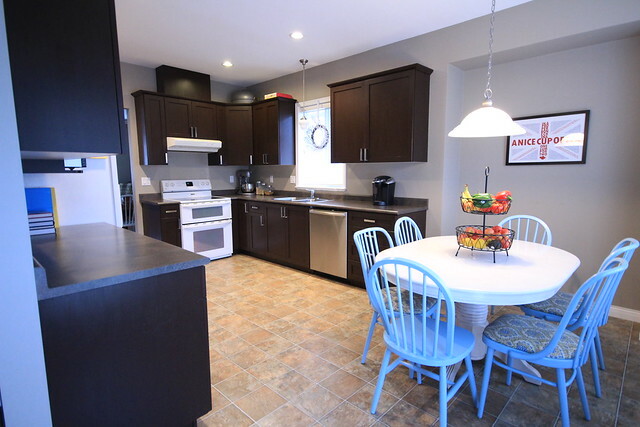 The room has come a long way, but I'd still like a new fixture over the table, a seating bench in the window area and some shelving in the bump out where my "A Nice Cup of Tea" print hangs. 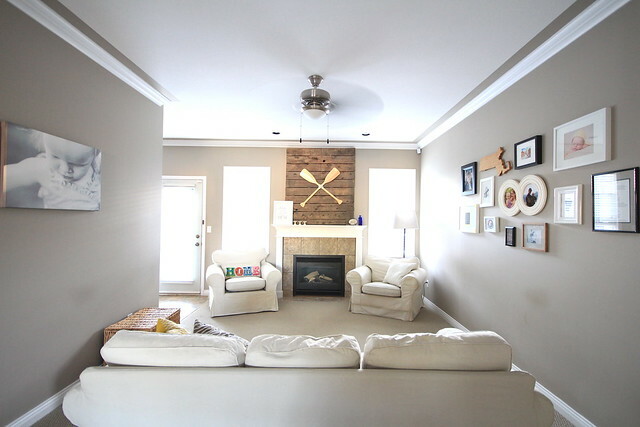 The family room was bland and boring when we bought the house. 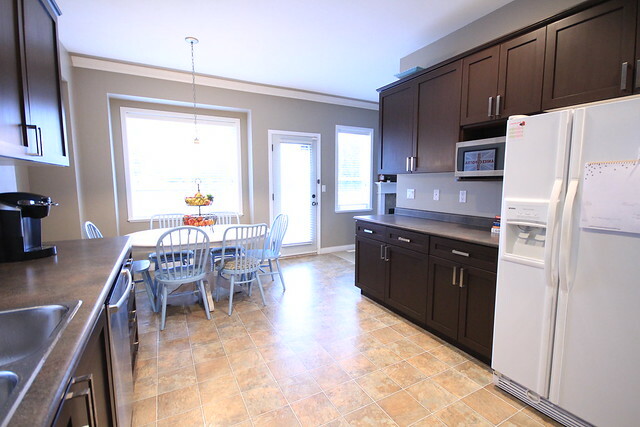 It hasn't been painted yet since it opens into our dining room, kitchen and main entry. We've done what we can with what we have though. 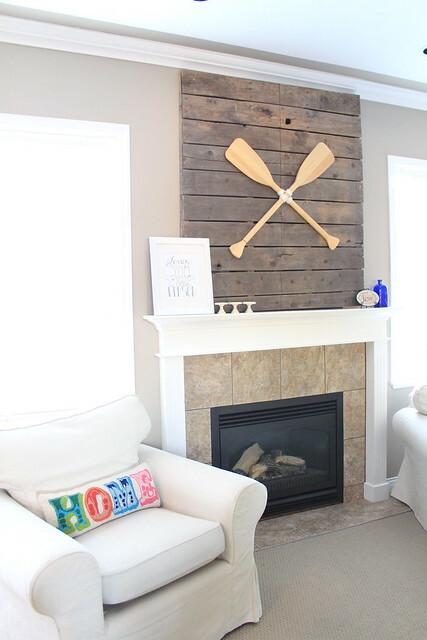 The pallet over the fireplace is one of my favourite pieces. It's a pallet that B got for free. He ripped it in half and attached two oars that we purchased on sale from Canadian Tire. We originally planned on using hinges to hang it so we could keep seasonal decor behind it in the "alcove", but it wouldn't fit properly. B ended up screwing it directly to the wall and it works perfectly. We're so happy to have that hole covered by something we love! 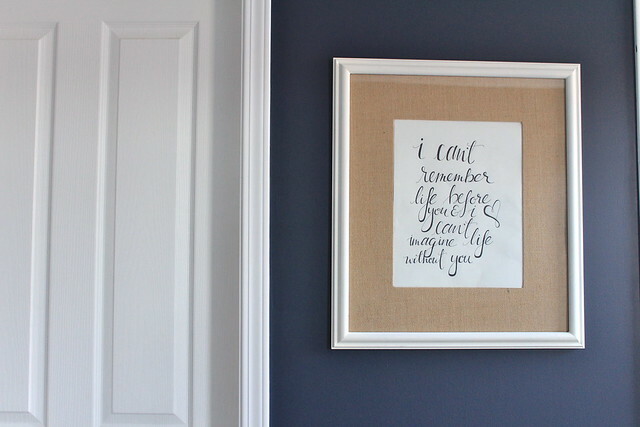 Our gallery wall in this room holds a lot of meaning. B is from Massachusetts, hence the cutting board we have hung. The picture in the top right is a watercolour of the Spanish Steps, which I bought when I was in Rome in 2005. 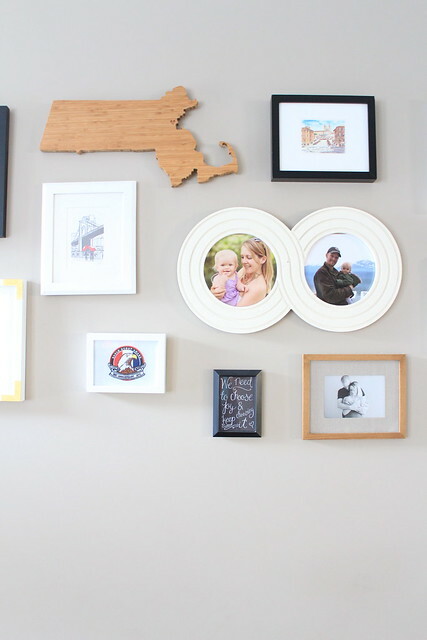 The print in the white frame below Massachusetts is of a couple in New York, a reminder of where we met and fell in love. The small white frame is an anniversary Eagle Scout badge B received - and of course our family photos always make us smile. 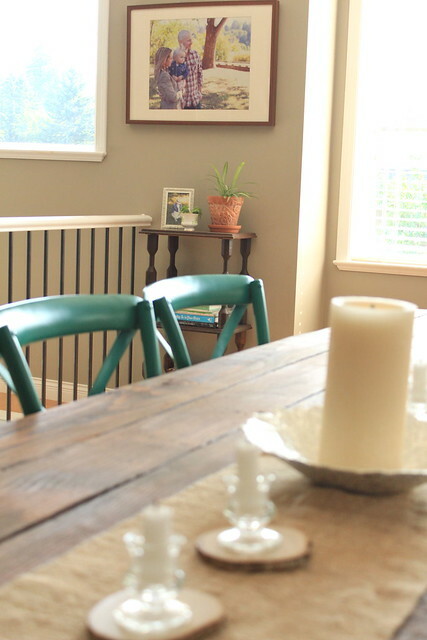 When we bought our home we thought it was great that everything was neutral and grey... then we lived here for a few months in this rather grey climate and realized it wasn't as wonderful as we thought. This past winter I finally painted our bedroom - choosing a dark moody blue, inspired by the room we stayed at when we were in Scotland for our honeymoon. We're slowly adding artwork to the space. 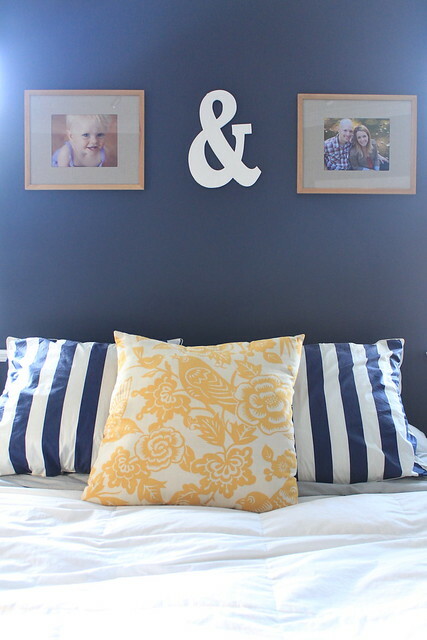 Family photos over the bed with an ampersand that my father made for us. The frame between our closet and our bathroom is a piece that I created for B for our 1st Anniversary (which is on Sunday, but I gifted it to him early). Our most recent artwork addition is this large print that I took from the top of Arthur's Seat in Edinburgh last September. This is my favourite photo from our honeymoon, and again I had it printed when Shutterfly ran a promo for a free 16x20 print. It's the perfect addition to our room, and the best reminder possible of our incredible honeymoon! 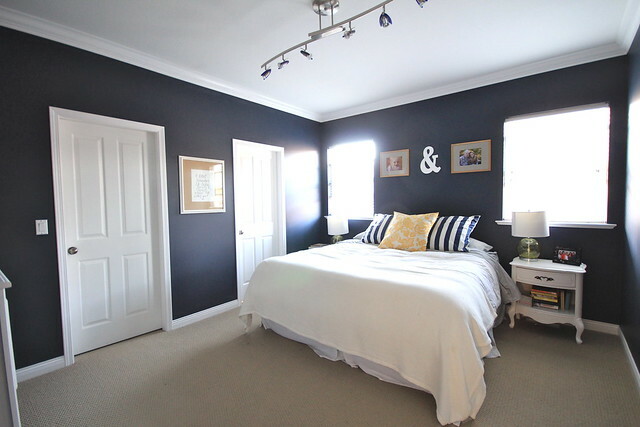 When we got the keys, H's bedroom was the very first one we painted. B spent a night sleeping on the floor here since we wanted it all painted before we moved in. The walls and closet doors were horrible and dirty. 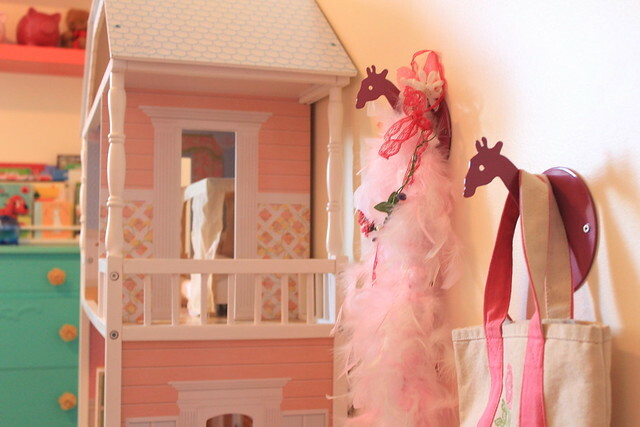 We took the room from a bubble gum pink nightmare to a bright and airy little girl's space. 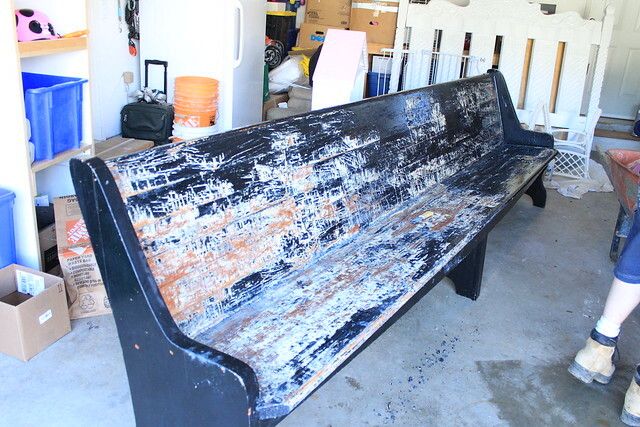 The bedframe was a $6o score on craigslist. 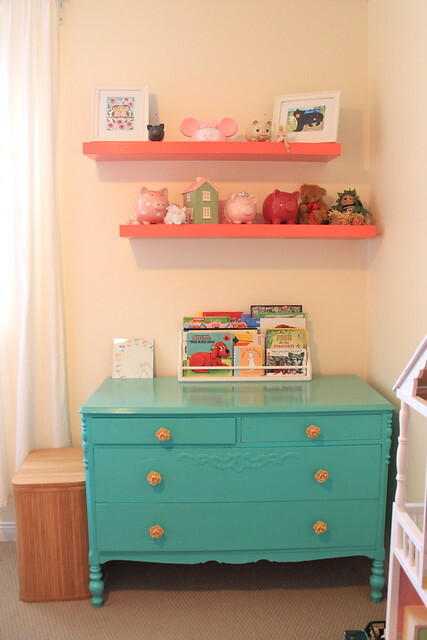 The shelves were left by the previous owners and we painted them coral (her closet doors are the same colour). 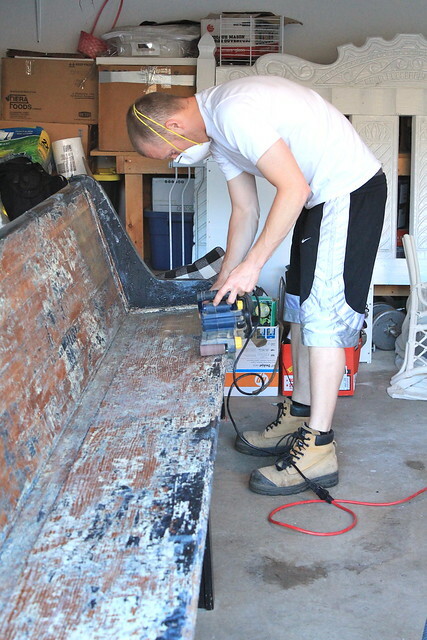 The dresser is a DIY project that B and I tackled when she was a baby. 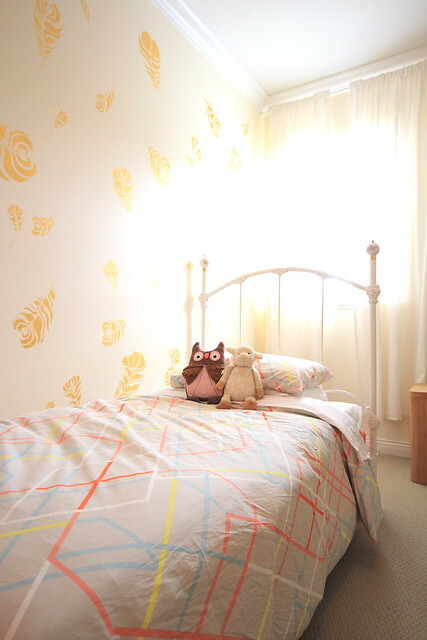 I was thrilled to find the IKEA PS 2014 Duvet Cover for her bedroom, as it ties together the coral, teal and yellows that are scattered throughout the space. Her boxspring is covered in a coral fitted sheet from Target and her sheets are a plain white. 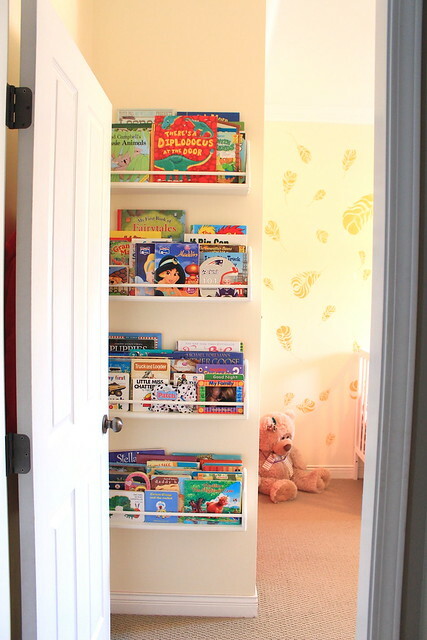 Her bookshelves may be my favourite part of her room. My father made them for us when I was pregnant with her and they are perfect for her ever expanding book collection (I may need him to make her more). 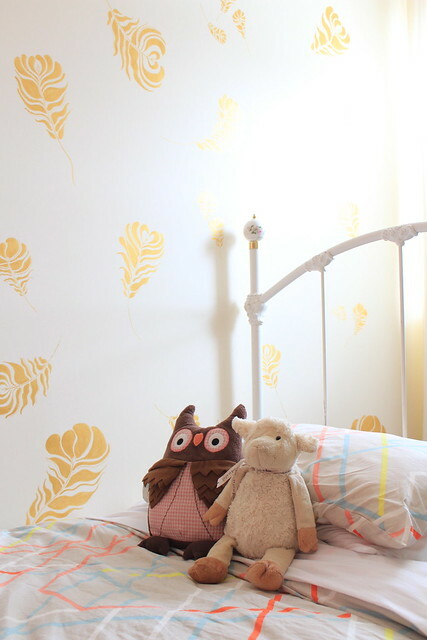 The gold plumes were a cheap, but not quick addition to make her room a little more fun. I handpainted each one last fall using metallic gold acrylic paint. Each plume needed two coats of paint and it took a while as I had to free hand them, but I think it was so worth it. 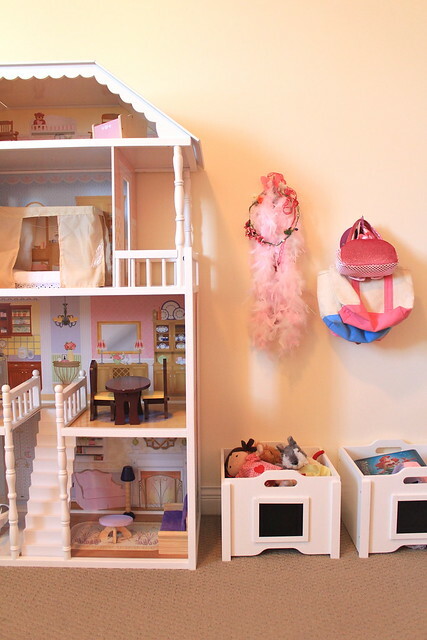 Whenever people visit, she loves to show off her bedroom and announce "My Mommy painted these for me!". I love that she loves them so much! Looking for some more fabulous interiors and inspiration? 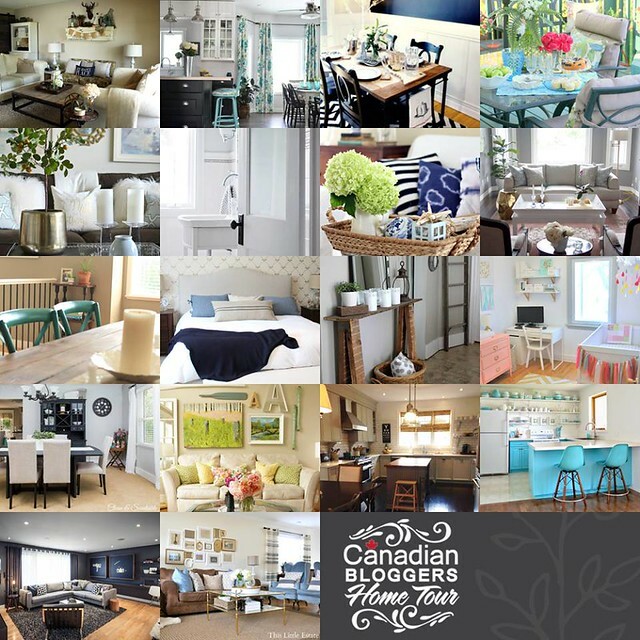 Make sure to check out all of the Canadian bloggers that are giving you a look at their home! If these teaser shots don't convince you, I don't know what will! Stop by and show them all a little love and be inspired! Links below!